Find artworks, auction results, sale prices and pictures of Boris Israelewitsch Anisfeld at auctions worldwide. 14. ANISFELD, BORIS (1878–1973) The Garden of Hesperides, signed and dated 1914-1916. 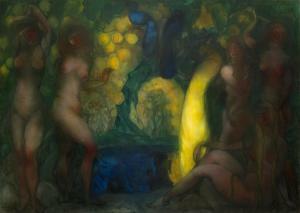 Oil on canvas, 178 by 249 cm. Provenance: Estate of the artist. Shepherd Gallery, New York. 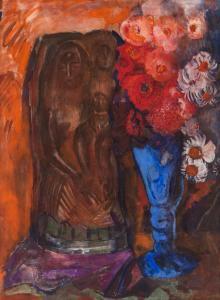 Russian Art, Sotheby\’s New York, 17 April 2007, lot 369. Private collection, UK. Exhibited: Mir iskusstva. Vystavka kartin, Petrograd, February–March 1916, No. 3. The Boris Anisfeld Exhibition, itinerant: Brooklyn Museum, Boston Art Club, Albright Art Gallery Buffalo, Cleveland Museum of Art, Detroit Institute of Art, Milwaukee Art Institute, Minneapolis Institute of Art, St Louis City Art Museum, San Francisco Palace of the Legion of Honor, The Art Institute of Chicago, 1918–1920, No. 63. The Boris Anisfeld Exhibition, Reinhardt Gallery, New York, 25 March–12 April 1924, No. 10. Exhibition of Paintings and Drawings by Boris Anisfeld, Worcester Art Museum, 6–13 November 1924, No. 31. Exhibition of Paintings and Drawings by Boris Anisfeld, Boston Art Club and The Twentieth Century Club, Boston, 10 December 1924–3 January 1925, No. 31. Exhibition of Paintings by Boris Anisfeld, Buffalo Fine Arts Academy and Albright Art Gallery, Buffalo, 12 February–12 March 1928, No. 6. Boris Anisfeld in St Petersburg 1901–1917, Shepherd Gallery, New York, 1984, No. 47. Boris Anisfeld \“Fantast-Mystic\”. Twelve Russian Paintings from the Collection of Joey and Toby Tanenbaum, itinerant: Art Gallery of Ontario, Toronto; Laurentian University Museum and Art Centre, Sudbury; Art Gallery St Thomas-Elgin, St Thomas; Tom Thomson Memorial Art Gallery, Owen Sound, 1989–1990, No. 11. Literature: Exhibition catalogue, Mir iskusstva. Vystavka kartin, Petrograd, 1916, No. 3. C. Brinton, The Boris Anisfeld Exhibition, New York, Redfield Kendrick Odell Company Inc., 1918, No. 63, illustrated and listed with incorrect date. L. Weinberg, \“The Art of Boris Anisfeld\”, The International Studio, vol. 66, November 1918, pp. III–XI, No. 261. H. Tyrell, \“The Exotic Art of Boris Anisfeld\”, The Christian Science Monitor, c. 1918. W. H. D., \“The Anisfeld Pictures\”, The Evening Transcript, Boston, c. 10 November 1918. N. N., \“A Russian Painter and New York Water Colorists\”, The Nation, 16 November 1918, pp. 595–596. F. Coburn, \“Russian Artist Exhibits Works\”, The Boston Herald, 10 December 1918. A. Philpott, \“New Thrill From Anisfeld Pictures\”, Boston Daily Globe, 10 December 1918, p. 5. F. de Cisneros, \“La Opulencia Bizantina. Boris Anisfeld\”, Social, Havana, 1918, p. 19, illustrated. C. Brinton, \“The Boris Anisfeld Exhibition\”, Brooklyn Museum Quarterly, January 1919, pp. 11 and 18, mentioned in the text. \“Boris Anisfeld\’s Paintings Big Art Feature\”, Buffalo News, 18 January 1919. M. Kinkead, \“Boris Anisfeld. Colorist\”, Asia, 19 February 1919, pp. 170–172, illustrated. M. Roberts, \“The Great Russia Put on Canvas, Illustrated by the Paintings of Boris Anisfeld\”, The Touchstone, February 1919, p. 392. J. Glasier, \“Anisfeld\’s Fantastic and Modernist Canvases Go on Exhibition at Museum\”, Plain Dealer, Cleveland, 16 and 23 February 1919. \“Cleveland\”, American Art News, New York, 29 March 1919. M. Williams, \“Painted His Pictures as Russian Guns Roared — Boris Anisfeld\’s Exhibition in Chicago Full of Slav Atmosphere\”, News, Chicago, 5 April 1919. E. Jewett, \“New Paintings at Institute Form Notable Exhibit\”, Daily Tribune, Chicago, 6 April 1919, p. D7. Marcus, \“Anisfeld\’s Paintings Give Thrills to Visitors at Institute\”, Herald, Chicago, 10 April 1919. Bulletin of the Art Institute of Chicago, May 1919, pp. 70–71. \“The Anisfeld Collection\”, Argonaut, San Francisco, 3 May 1919. \“Anisfeld Exhibition Still Big Attraction\”, Bulletin, San Francisco, 28 May 1919. \“Boris Anisfeld\’s Pictures\”, Mirror, St Louis, 24 July 1919. \“Anisfeld Pictures at Art Institute\”, Milwaukee Sentinel, 20 September 1919. M. Mayhew, \“Anisfeld Works Attract Critics\”, Milwaukee Sentinel, 21 September 1919. Exhibition catalogue, C. Brinton, The Boris Anisfeld Exhibition, New York, Reinhardt Gallery, 1924, No. 10, listed. Exhibition catalogue, Exhibition of Paintings and Drawings by Boris Anisfeld, Worcester, Worcester Art Museum, 1924, No. 31, listed. P. B., \“Anisfeld Pictures Opulent in Colour\”, Art News, 29 March 1924. Exhibition catalogue, Exhibition of Paintings and Drawings by Boris Anisfeld, Boston, 1924, No. 31, listed. Exhibition catalogue, Exhibition of Paintings by Boris Anisfeld, Buffalo, Fine Arts Academy, Albright Gallery, 1928, No. 6, listed. M. Williams, \“About a Painter Without Theories\”, Chicago Daily News, 8 January 1930. Boris Anisfeld in St Petersburg 1901–1917, New York, Shepherd Gallery, 1984, No. 47, plate 47, illustrated in black and white. R. Mesley, Boris Anisfeld \“Fantast-Mystic\”. Twelve Russian Paintings from the Collection of Joey and Toby Tanenbaum, Toronto, 1989, pp. 60–63, illustrated. G. Romanov, Mir iskusstva. 1898–1927, St Petersburg, Global View, 2010, p. 34, No. 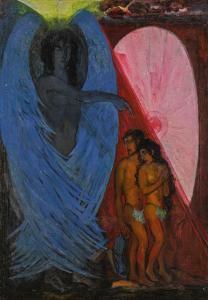 3, included in the list of works for the 1916 exhibition. E. Lingenauber and O. Sugrobova-Roth, Boris Anisfeld. Catalogue raisonné, Düsseldorf, Edition Libertars, 2011, pp. 110–111, No. P 084, illustrated and listed. The Garden of Hesperides, offered here for auction, was painted by Boris Anisfeld in 1914–1916, during his Russian period, the most productive and important in his career. The painting is a colourful, dreamlike symphony reminiscent of the artist\’s stage designs with their spectacular colour, which earned him the soubriquet \“the alchemist of colour\”. Anisfeld was recognised early on in his career as both a painter and theatre designer, and his paintings of dreamlike reveries and fairy-tale extravaganzas were particularly celebrated. From 1907, the artist worked for the theatre, designing sets for Diaghilev\’s ballets and Meyerhold\’s productions. The influence of the theatre is particularly manifest in his early works. His large-scale easel compositions, such as the present work, often resemble sets from grand stage productions. In 1914, Anisfeld stopped working for the theatre and focussed exclusively on painting. He turned to biblical and mythological subjects, seemingly aiming to emphasise their timelessness and universal relevance during the turbulent war years. This presented work is based on the legend of the Hesperides, the nymphs of evening and sunset in Greek mythology. According to the story the Hesperides, the daughters of Night, lived with the dragon Ladon at the edge of the world, on the banks of the River Ocean, and guarded the golden apples of youth that Hera, wife of Zeus, had received as a wedding present. When Anisfeld painted The Garden of Hesperides, he was greatly influenced by the French Fauvism and Symbolism. At that time he also fell under the spell of Paul Gauguin, whose fusion of Symbolism and Decorativism he particularly admired. Having chosen colour as his primary means of expression in The Garden of Hesperides, Anisfeld strove to transform the real world into a vibrant spectacle. His painting is expressive and temperamental, his brushstrokes are broad, and he does not shy away from using striking colours. As the artist Constantin Sunnerberg observed, Anisfeld\’s painting was a \“reverie of deep shades of red, blue, emerald-green and yellow\”. Anisfeld immigrated with his family to the USA in 1917 and never returned to Russia. However, in the turmoil of revolution he nevertheless managed to obtain authorisation to take his works out of the country. Already in 1918 he had a solo exhibition in the Brooklyn Museum in New York, where the majority of his works were shown. The work of undoubtedly museum quality, The Garden of Hesperides, was among those shown in New York and according to archival documents was also the most expensive painting in the show, valued at 12,000 USD, an enormous amount for that time. Boris Izrailevich Anisfeld (Russian, 1879-1973) St. George and the Dragon signed in Latin (lower left); inscribed in Latin 'St. George and the Dragon' (verso) oil on canvas 77 x 64cm (30 5/16 x 25 3/16in). Footnotes Provenance Acquired in the UK from a private collector Exhibited Probably, Chicago, VIII Anual Religious Art Show, 1967 Moscow, Museum of Contemporary Art in Neglinnaya Street, Boris Anisfeld, 2001 Literature Boris Anisfeld, Moscow, 2001, p. 56 illustrated N. Semyonova, "The alchemy of colour. Work of B.I. Anisfeld," Nashe Nasledie, no. 61, 2002, p. 121 illustrated E. Lingenauber, O. Sugrobova-Roth, Boris Anisfeld, catalogue raisonné, Dusseldof, 2011, no. P133, p. 117 illustrated 'I paint what I feel, not what I see,' Boris Anisfeld once said and he adhered to this simple principle throughout his career. Mostly known as a theatre designer, Anisfeld's vibrant paintings are are imbued with a boldness of colour and dynamic flow. Born in Bessarabia, in 1895 Anisfeld enrolled at the Odessa Drawing School. He continued his education at the Academy of Arts in St. Petersburg, where he quickly developed a reputation as a serious painter and a theatre artist. Arguably, the finest work of the artist's canon was painted in America, to where Anisfeld moved in the 1920s and became one of the first of numerous artists, composers and writers to leave their native Russia to teach and work there. Nonetheless, as an artist Anisfeld matured differently in America than he might have done in the Soviet Union. Over more than 50 years of painting and more than 30 years of teaching, Anisfeld encouraged each artist that ultimately he must come to trust what he 'feels...he has helped teach the spectator that in the end he must come to trust what he sees' (Dudley Crafts Watson, Boris Anisfeld, Retrospective Exhibition, the Art Institute of Chicago, 1958). 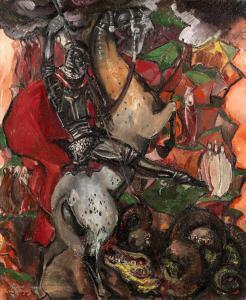 The offered lot St. George and the Dragon is the most brilliant example of a theme which preoccupied Anisfeld throughout his artistic career. The artist derived his self-expression, freedom and inspiration from the themes of Ancient Russia, with St. George a perennially strong image. Indeed, the coat of arms of Moscow depicts a horseman with a spear in his hand slaying a basilisk – ordinarily identified with St. George and the Dragon. St. George had been a patron saint of Moscow since the 16th century and this reference to the theme of a Christian Saint by a Jewish artist is an interesting example of the dual identity of Russian Jews. St. George and the Dragon is a superb example of the artist's finest work. Anisfelds's bold colour palette with its complimentary greens and reds and its extraordinary sense of colour and dynamic composition reveals a very timeless form of artistic experience. Boris Anisfeld (1878-1973) The Indian Madonna signed 'Boris Anisfeld' (lower left); inscribed with title (on the reverse) oil on canvas 41½ x 30 in. (105.4 x 76.2 cm.) Painted circa 1949 Provenance Acquired from the artist by Shoshanna Hoffman, Chicago. 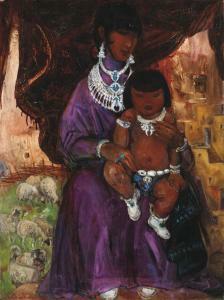 Private Collection, New Mexico. Anonymous sale; Sotheby's New York, 22 April 2010, lot 346. Acquired at the above sale by the present owner. BORIS ANISFELD (RUSSIAN 1878-1973) Arrangement with Sculpture and Flowers in a Vase, 1952 tempera and oil on canvas 101.5 x 76 cm (40 x 29 7/8 in.) signed and dated lower right PROVENANCE Sotheby's, New York, April 15, 2008, lot 68 We are grateful to Mr. Charles Chatfield-Taylor for confirming the authenticity of the work.